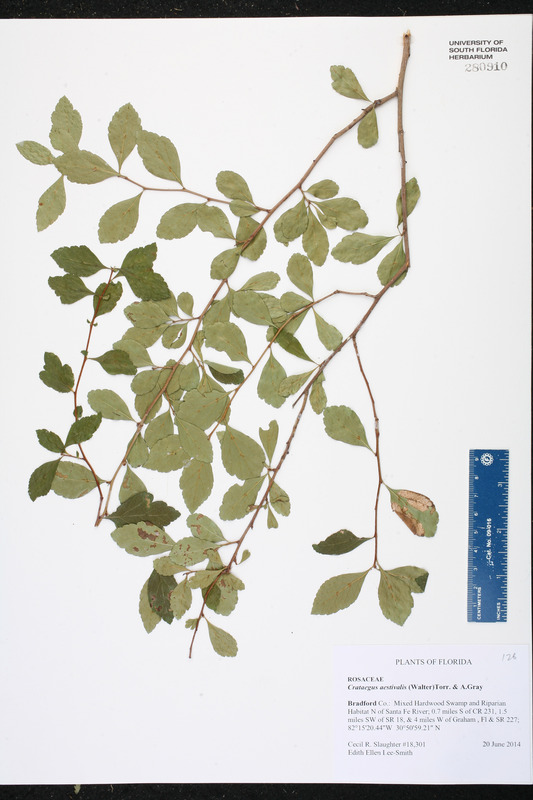 Citation CRATAEGUS AESTIVALIS (Walter) Torrey & A. Gray, Fl. N. Amer. 1: 468. 1840. Basionym: Mespilus aestivalis Walter 1788. Type: SOUTH CAROLINA: Colleton Co.: Along Combahee River, E of Yemassee, 15 Mar & 21 May 1916, Harbison s.n. (neotype: GH; isoneotype: NCU). Neotypified by D. B. Ward, J. Bot. Res. Inst. Texas 2: 481. 2008. Anthomeles aestivalis Anthomeles aestivalis (Walter) M. Roemer, Fam. Nat. Syn. Monogr. 3: 141. 1847. BASIONYM: Mespilus aestivalis Walter 1788. Crataegus aestivalis forma luculenta Crataegus aestivalis (Walter) Torrey & A. Gray, forma luculenta (Sargent) Sargent, J. Arnold Arbor. 1: 251. 1920. 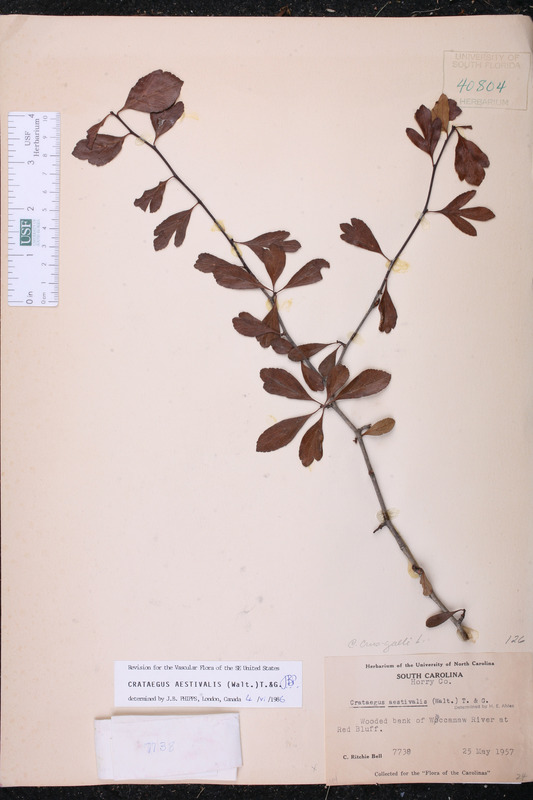 BASIONYM: Crataegus luculenta Sargent 1902. Crataegus aestivalis var. cerasoides Crataegus aestivalis (Walter) Torrey & A. Gray, var. cerasoides (Sargent) Sargent, J. Arnold Arbor. 1: 250. 1920. BASIONYM: Crataegus cerasoides Sargent 1913. Crataegus aestivalis var. maloides Crataegus aestivalis (Walter) Torrey & A. Gray, var. maloides (Sargent) Sargent, J. Arnold Arbor. 1: 250. 1920. BASIONYM: Crataegus maloides Sargent 1902. Crataegus cerasoides Crataegus cerasoides Sargent, Trees & Shrubs 2: 237. 1913. TYPE: FLORIDA: Volusia Co.: Near Seville, Jun-Jul 1901, Curtiss 6842 (holotype: A?). Crataegus fruticosa Crataegus fruticosa Sargent, Trees & Shrubs 1: 13, pl. 7. 1902. TYPE: FLORIDA: Volusia Co.: Near Seville, Aug 1900 & Apr 1901, Curtiss 6703 (holotype: A?). Crataegus luculenta Crataegus luculenta Sargent, Trees & Shrubs 1: 11, pl. 6. 1902. TYPE: FLORIDA: Volusia Co.: Haw Creek, Jul 1900 & Mar-Apr 1901, Curtiss 6677 (holotype: A?). Crataegus maloides Crataegus maloides Sargent, Trees & Shrubs 1: 9, pl. 5. 1902. 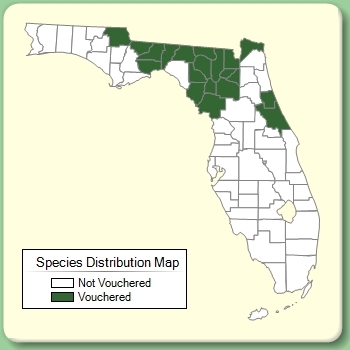 TYPE: FLORIDA: Volusia Co.: Haw Creek, 6 mi. E of Seville, Jul 1900 & Mar-Jun 1901, Curtiss 6679 (holotype: A?). Crataegus monantha Crataegus monantha Sargent, Trees & Shrubs 2: 237. 1913. TYPE: FLORIDA: Volusia Co.: Near Seville, 16 Jul 1900, Curtiss 6703 (holotype: A?). Crataegus rufula Crataegus rufula Sargent, J. Arnold Arbor. 1: 251. 1920. Mespilus aestivalis Mespilus aestivalis Walter, Fl. Carol. 148. 1788. TYPE: SOUTH CAROLINA: Colleton Co.: Along Combahee River, E of Yemassee, 15 Mar & 21 May 1916, Harbison s.n. (neotype: GH; isoneotype: NCU). Neotypified by D. B. Ward, J. Bot. Res. Inst. Texas 2: 481. 2008.